A US archaeological expedition led by Professor Wyndham (Wright Kramer) has unearthed the legendary "Seven Jewels of the Seventh Pharaoh." 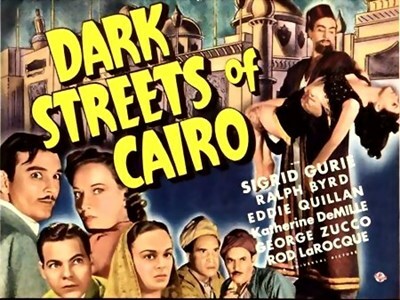 Before the expedition can sail back home with its loot, a sketchy dealer in Egyptian antiquities named Abbadi (George Zucco) orders his gang to steal the gems and substitute glass duplicates for the real things. Abbadi's gang is actually an underground organization called the Brotherhood of the Secret Defenders --- although never stated explicitly, it's suggested that the Secret Defenders are an Islamic nationalist group, that target Western infidels who come to Egypt to dig up ancient cultural artifacts. As part of his scheme, Abbadi contacts Baron Stephens, a wealthy Swedish art collector, who comes to Cairo with his niece Ellen (top-billed Sigrid "The Siren of the Fjords" Gurie).